Helloooo, Bagels! Or, I want it all. When we moved from Boston to Blacksburg, 20+ years ago, I had a “quality of life” checklist. It included access to the New York Times and a particular brand of chocolate. Both were available at that time; tellingly, a daily NYT is no longer available (tho’ Sundays edition is) but the sheer variety of chocolate available now has increased by a factor of ten. You can get organic, you can get fair trade, you can get single-source, you can get flavors: cocoa nibs, burnt caramel, candied bacon. Quality of life indeed! Hello Bagel is on South Main Street, a few doors down from the Vintage Cellar. 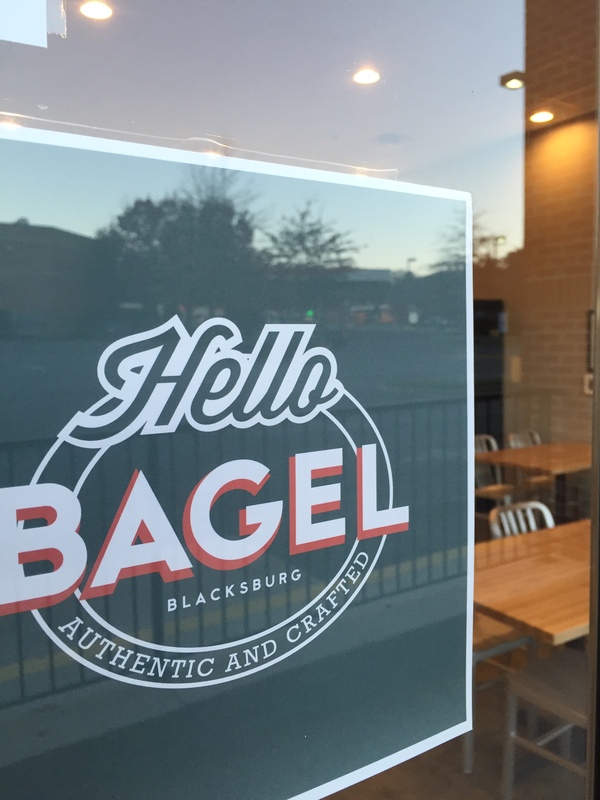 However, until this past Monday, there was no decent bagel shop in Blacksburg. There was a spot about ten years ago that folded. There are frozen options. There’s a supplier that comes to the farmer’s market and the local food coops. So when I heard about the “soft” opening of Hello Bagel, I set my alarm for 6:15 and I stumbled to the car in the dark and I drove ‘cross town and I paid for still-warm bagels and a cup of coffee and lo, it was almost a religious experience. It certainly restored my faith in the virtue of rising early. 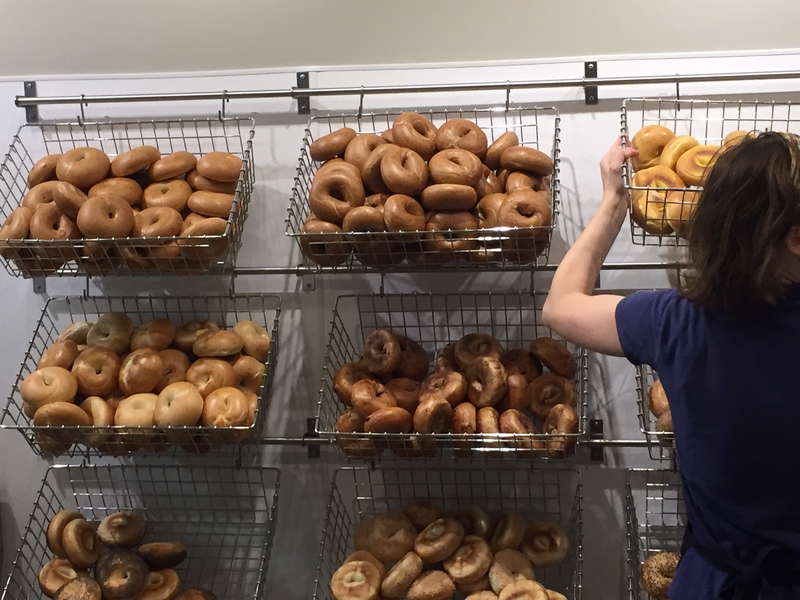 And here’s the rub, for me: the only reason Blacksburg now boasts a bagel shop is that this small town ain’t so small anymore. (When we arrived in ’92, I could get anywhere in town in 10 minutes, tops. Today, I plan on twenty, or thirty if I want to be able to walk into my meeting instead of run (yes, big-city dwellers, I realize that’s not a “real” commute). I miss the small town I moved to. BUT: if there weren’t so many people here, the writing workshops I’m offering (another shameless plug: The Joyful Quill) wouldn’t have enough participants to come alive. The writers’ groups I work with would have no new faces. And those those who live in Real Cities will point out: uh, you do live in a small town. They’re right, of course. And so am I. Blacksburg is small. It used to be smaller. And it’s smaller than it (probably) will be in ten years. Holding both these perceptions without denying the accuracy of either one acknowledging that more than one thing may be “true” is uncomfortable: we want Our Way to be the Right Way. If Other Ways are equally valid, then what does that make me? Wrong? I don’t want to be wrong! A colleague recently shared an observation of me as “too worried with what other people may think.” I can’t argue. More often than not, in any given group of people, I am more interested than others in considering the possible ways my actions, or the actions of my group, may be perceived. And don’t the Great Writers ignore what others think? Wield a machete through the thicket of conventional writing? What if Virginia Woolf had done nothing but worried about what people thought of her work? No Mrs. Dalloway? Perish the thought! I want it all: a town where I can get a terrific bagel and arrive ten minutes later at my writing group, with said bagel still warm, its schmear of cream cheese a little melty. I’m not gonna get it all. I am gonna enjoy sitting in the middle of it all, noticing the contradictions inherent in my big small town, in writing with and against conventions, in considering what others may think, and deciding if and when to cast it aside. There’s a lotta bagel flavors out there. I’m gonna try them all. *I can hear the critics thrashing and gnashing: but some writing IS better than others! There are so “right” and “wrong” ways to write! And I agree: for publication, you betcha there are standards. I also note that standards deemed James Joyce’s Ulysses obscene. Standards pilloried Kate Chopin for The Awakening. We want it both ways but that’s a tough row to hoe: be a Great Writer that ignores standards AND adhere to the conventionally-accepted “right” and “wrong” ways of writing or your work won’t see the light of day, and your career will be kaput. I’m all about figuring out what we want to say and saying it to the best of our ability but hey: eyes wide open, folks. Every rant is not genius, today’s anointed geniuses may be tomorrow’s remainders, and every unpublished, half-way decent writer who keeps getting up early, making coffee, and setting their thoughts down, on anonymous paper in an anonymous house in an anonymous life — they are countless. I don’t know how to fit them into this paragraph. But I honor their attention to their writerly selves. This entry was posted in Essays and tagged Blacksburg, Hello Bagel, I want it all, James Joyce, Mrs. Dalloway, schmear, small town, the Joyful Quill, Ulysses, Virginia Woolf, writing, writing conventions. Bookmark the permalink. In 1994 when I disembarked a train near Blacksburg with my pack on my back and my guitar, within minutes a young woman pulled up to me and offered a ride. She said it wasn’t particularly safe for me alone. I was grateful for the ride and the concern; in my home town, Seattle, everybody was either too depressed or too busy sucking down a starbucks to even notice other people. During this same trip I was offered a place to stay above a bike shop in Charlottesville because there were no spots left in the hostel. I had forgotten these small town kindnesses, thanks for jarring my memory! Reblogged this on Muñeca de Porcelana..